Here is a beautiful yogurt shop with a great corner location built from the ground up only 18 months ago. Take advantage of this opportunity today. The owner has health issues and needs out. The build out alone was over 195k and no expense was sparred in constructing this place. His loss is your gain, don’t miss out. Located in an extremely busy shopping center on one of the busiest streets in Oceanside, the customers are there for the taking. This business is currently absentee owner run so there is a lot of room for improvement. This place has potential are you the one to tap it? With an owner operator who shows some initiative this place could be a gold mine. The last 12 months show gross sales ranging from 5-10k per month. The five Taylor machines alone are worth the asking price. These top of the line yogurt machines are the water cooled models and the accompanying water cooling system alone was over 10k. The place is wired for control, from the surveillance system to the POS system, you are ready to account for every dollar being earned and spent. The highly visible space is right across from a Starbucks so you know the location is good. 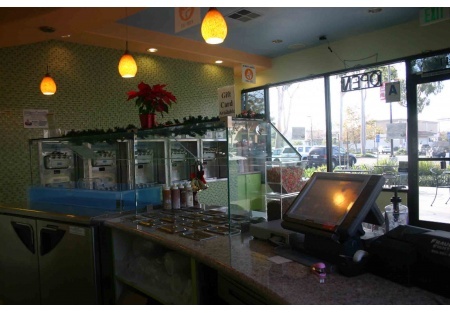 Customers can enjoy their yogurt in the outside common seating area perfect for relaxing. The space itself is a well laid out 654 square feet. Rent is $1684 per month plus CAM. Current lease term expires in March of 2014 with a five year option available. Owner may consider financing for the right buyer.